“Kiss my converse!” threatens the always-angry Sho’nuff (Julius Carry), aka The Shogun of Harlem, a hairspray-heavy kung fu brother who has seemingly raided Michael Jackson’s wardrobe, and hangs out with hoodlums transported from the set of a sci-fi film. Sho’nuff is hired by a sadistic record producer whose business tactics leave a lot to be desired. He kidnaps and harasses New York’s hottest pop star (that’s Vanity, by the way) in order to promote his own girlfriend on her TV show. Vanity refuses – because the girl is clearly terrible – and calls in the movie’s naïve hero, ‘Bruce’ Leroy Green (a 19-year-old Taimak in his first film), to protect her. Leroy’s a virtuous, philosophising kung fu expert who utilises the wisdom of his sifu and the teachings of an on-screen Bruce Lee to search within himself and master ‘the glow’. This makes him something of a square among his contemporaries; even his baby brother is cooler than him. 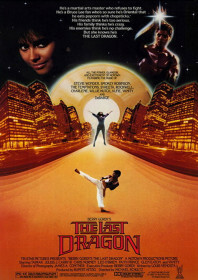 The Last Dragon would prove to be Motown Productions’ last theatrical release (Berry Gordy acts as executive producer), and it is both acerbic and very funny: not just in its sassy, cross-cultural awareness and social commentary, but also in its downright weirdness. It is both a homage to the grindhouse popularity of kung fu films – particularly among New York’s young, African-American communities – and a fizzy, fun, non-stop pop video, designed as a cross-promotional tool to sell Motown’s latest product. Hits include DeBarge’s Rhythm of the Night – a solid, dance-floor filler if ever there was one. Its spontaneous dance routines, brimming colour and sense of style has helped to guarantee a dedicated cult following since its initially lukewarm release in 1985. The tasteful Bruce Lee references and fantasy ‘glowing’ sequences only add to its unique charm. AKA: Berry Gordy’s The Last Dragon.